My friend Mike Reid (of the Cameron County, PA Reids) posted some pictures of his dog, Mia on Facebook. Mike and Mia ride around northern PA (mainly Cameron and Elk counties) and take fantastic pictures of the mountains, the streams, the elk, deer and occasional bear. Mia features heavily in these photo albums and Mike really ought to put them on a blog along with his Facebook page so people he doesn’t know can enjoy them. 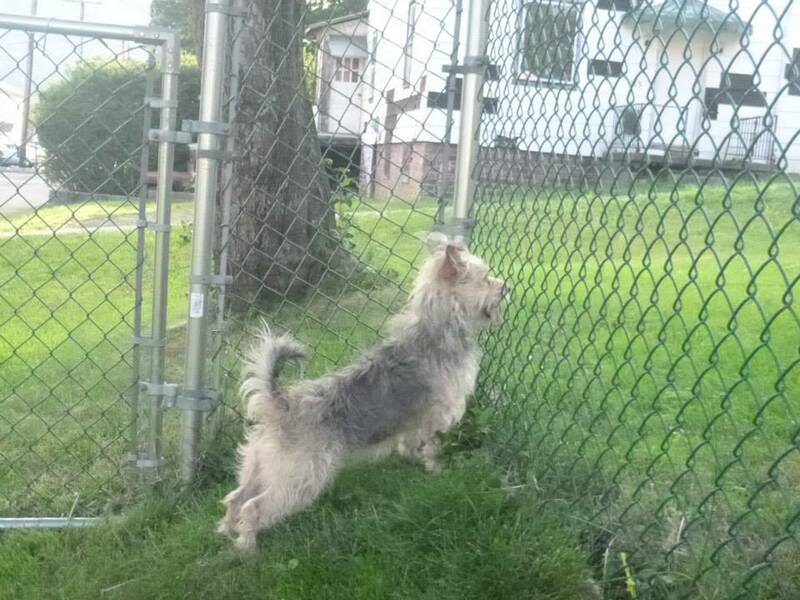 Mia is about 3 and Mike adopted her from the shelter in Coudersport, PA. She is part Maltese and Australian Terrier. Mike says she’s learned how to brace herself as they drive the twisting, turning roads of the PA mountains. Then something obviously caught Mia’s attention . . . 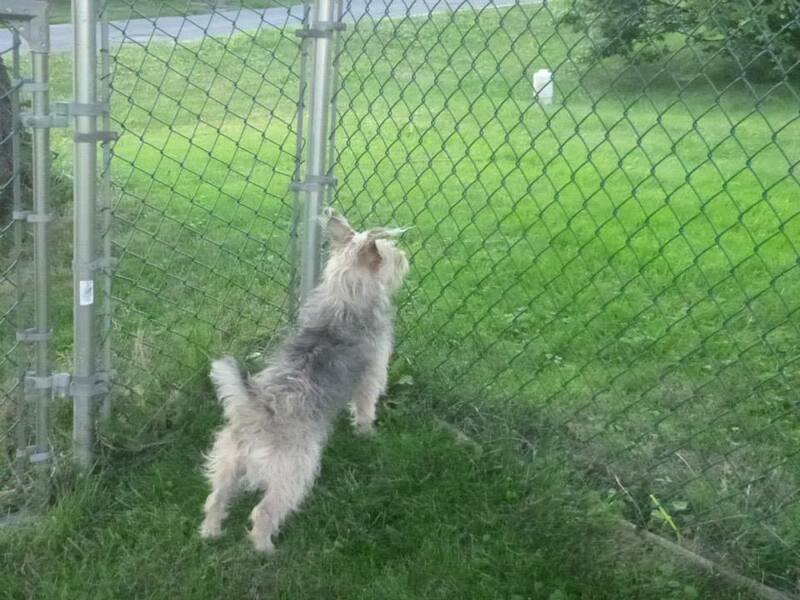 When I saw what was on the other side of the fence, I wanted to jump, too! 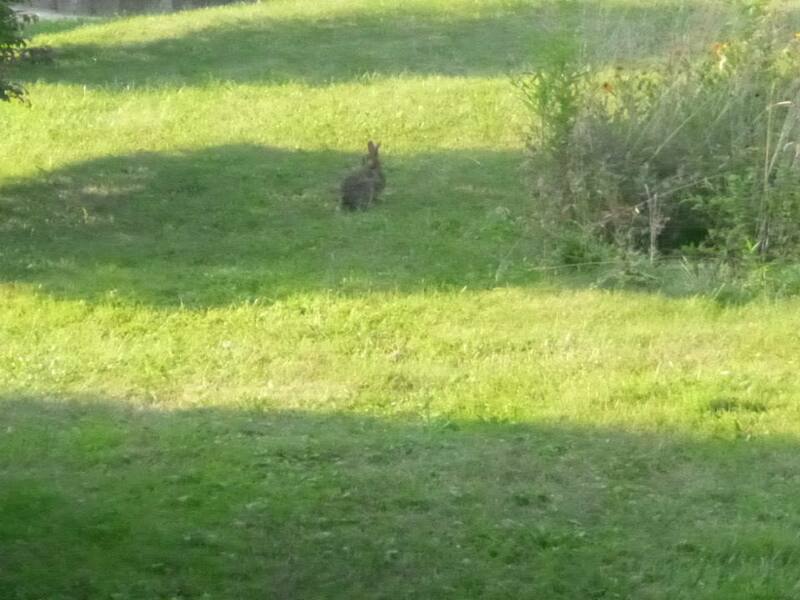 Keep in mind, I live in the ‘burbs and any wildlife I see here is city-sized . . .
Is it a rabbit or baby kangaroo? I’m not sure what would have happened had Mia caught the rabbit. Rabbits usually lose in the dog vs rabbit match-ups, but this rabbit is obviously on steroids! The week got even better when one morning I turned around to see Fasa, a beautiful red and white Siberian Husky, on my deck peering into the kitchen. Fasa is the granddog of my other next door neighbors and he visits them often and has taken to coming to visit me since I took down the fence. Fasa has incredible light blue eyes that look right through you (any excuse to link to a Beatles video). I didn’t have the camera handy, but I grabbed a frisbee (part of the BlogPaws 2013 swag) went outside and played with him for about 5 minutes. I hated to stop, but I had to get to work, plus the mosquitoes were eating me alive! I miss having dogs around, they make me laugh even when I feel lousy. Kenzie and Bourbon have been at their grandparents and I haven’t had anyone to dog sit lately, so it was welcome relief when I saw the pictures of Mia and the rabbit. Then Fasa came to visit and Deuce, one of the Durham Bulls mascot dogs that runs the bases after games, was found. He bolted after a fireworks display at Durham Athletic Park. So, even though I want to get another dog, I know the time isn’t quite right. I still have much to do before another dog adopts me, but I think I’ll start working faster! 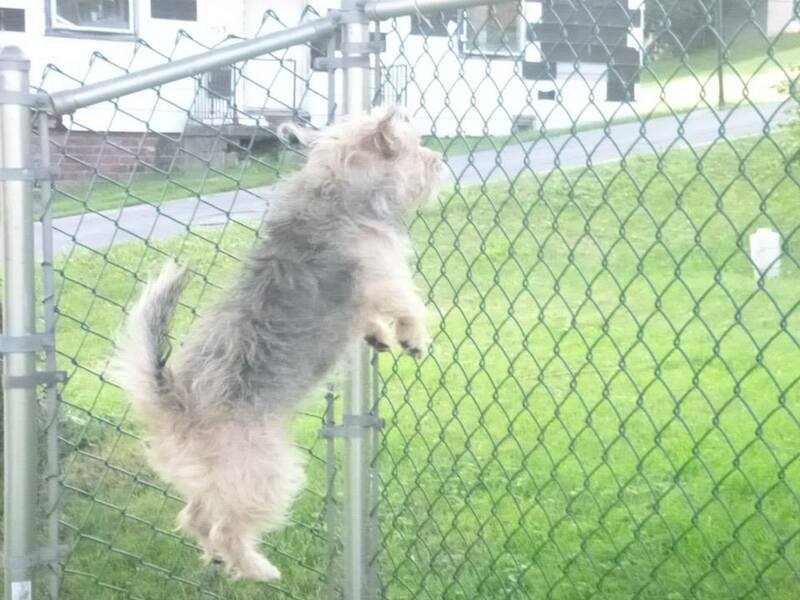 This entry was posted in Uncategorized and tagged Austrailian Terrier, Cameron County, dogs, Dudley, Maltese, Mia, Pennsylvania. Bookmark the permalink.